Today is J. M. Barrie's birthday. I love Peter Pan, but not for the usual reasons. When I've taught the book in the past, there are often a few female students who say they're excited to read it because they think the movie is so romantic. I just silently nod and smile and let them read it and decide for themselves if they still think that after reading the book. 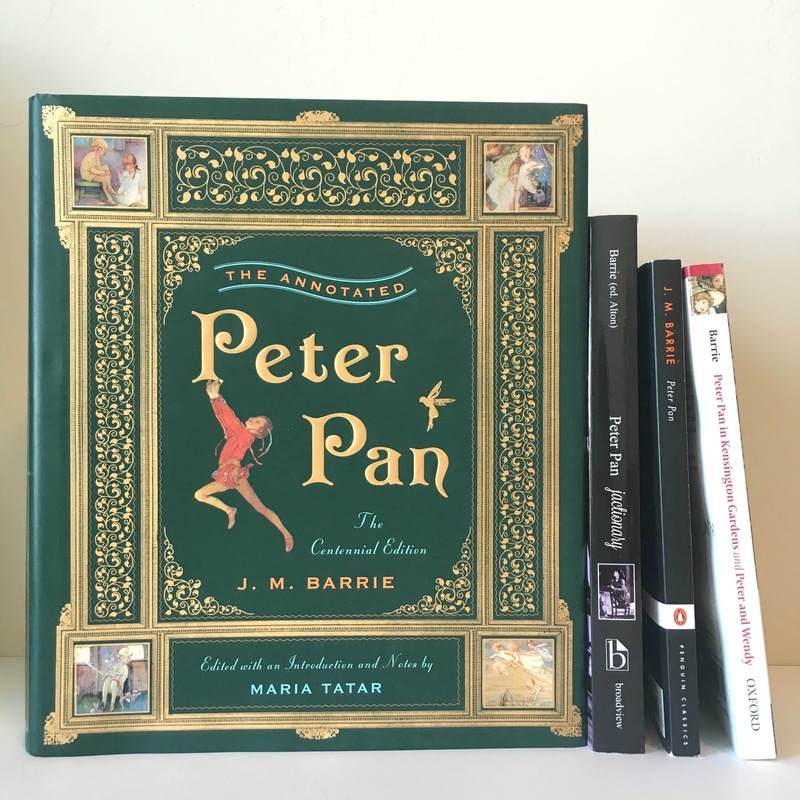 In one of my favorite classes I created, I taught 20th-century British and American literature and started the semester by using Peter Pan as our guide for the entire course and literature within the whole century. The students and our discussions were off-the-chart fantastic. I cannot wait to teach that course again. The story and Peter himself had so many reincarnations before evolving into the Peter and Wendy novel we now call Peter Pan. Not to be a downer, but the book raises so many issues about gender, racism, colonialism, childhood, and imagination that I love discussing it and could for hours. Furthermore, the life of J. M. Barrie and the Llewelyn Davies boys are so tragic and full of unanswered questions. I'm a firm believer in studying texts in their full context and when students talk about what happened with each of the boys there's always a somberness to our class, the same as when we talk about Alice's Adventures in Wonderland and the speculations about Alice Liddell (whether you believe the rumors about Carroll or not--I always keep my opinions about author's biographies to myself--the fact that she refused to talk about him or to him has to be part of the conversation). Here are four editions of Peter Pan I readily had on hand, but I think I have at least three or four other copies embedded within larger anthologies. If you're a book nerd and you've never checked out Maria Tatar's editions I highly recommend them! They're not really suited to child audiences or casual readers, but if you like footnotes and learning about cultural context they're fantastic. So "Happy Birthday" to J. M. Barrie! Thank you for a story worth talking about for over one hundred years! Have you read the play "Peter and Alice" by John Logan?! You should. It's this existential-ish conversation between a forever-young Pan and a very aged Alice (played originally on stage by Judi Dench). It is brilliant. I haven't read that! Thanks for the tip. I've added it to my to-read list!